Choose from our wide selection of Keno Supplies, including Keno Balls, Keno Crayons, and Keno Holders for Tickets and Crayons. All Keno supplies are in stock for fast shipment. These acrylic Keno Ticket Holders are available in see-through, clear acrylic or solid black acrylic designs. Each Keno Holder has compartments for both Keno paper and Keno Crayons. 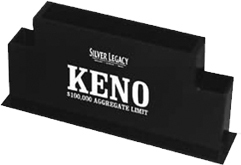 The Keno Holders measures 8-3/4" wide x 4-1/8" high. 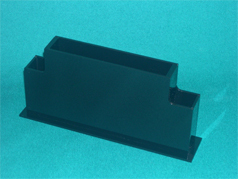 This acrylic Keno Ticket Holder is made of durable black acrylic. The Keno Holder has compartments for both Keno paper and Keno Crayons. Each Keno Holder measures 8-3/4" wide x 4-1/8" high. 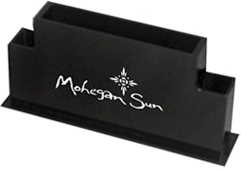 Custom imprint our square corner black Keno Caddies with your one- or two-color on one or both sides. These Keno Caddies measure 8-3/4" x 4-1/8". The minimum order is 25 Custom Imprinted Keno Ticket Holders. These Keno Crayons come in two sizes, 3½" or 5" sizes, and are available in 8 gross cases (1,152 crayon). Our 3.5" Custom-Imprinted Keno Pencils are available blank or custom-imprinted with your design. 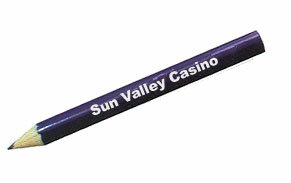 To order our Round Custom Keno Pencils, or more information, please contact us at 1-800-233-0828. Our Plastic Keno Balls are numbered on six sides and come with a white finish and precision weight. Keno Balls come in complete sets numbered 1-80. 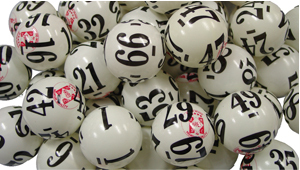 This value-priced Keno ball set includes 80 six-sided/black numbered, coated white balls. Please feel free to continue browsing Bingo Supplies and other Gaming Products online or contact us at 1-800-233-0828 for a FREE 104 Page Casino / Game Room Supplies Catalog.